It’s so hard for people to understand, and I don’t necessarily blame them. They don’t understand why I have trouble communicating, why I am so scared to go out places, why I freak out when I have to use the phone. I’m an adult. I should be able to do these things. What they don’t understand is how much I missed learning and experiencing for the first 29 years of my life. Even after I ran away, my experiences of life were skewed. I was in an environment that really wasn’t the best for me. I told myself it was okay because it was better than where I came from, but the truth is that being in that environment held me back. I was no longer a prisoner of my mother’s home, but for multiple reasons, I became a prisoner in my own room. The ways of life I was experiencing were not the ways I thought a normal life would be. But I didn’t know any better at the time. All I had to go by was the word of those close to me, and those were not the best people to learn life from. I lost hope for a bit when my mother found me, shortly after my 500 days of freedom. I believed that was going to be it for me. Those next few months were the hardest. I questioned whether it was all worth it. No family, dwindling friendships, increasing debt — I was living on leftover scraps and cheap rice from the dollar store, functioning on little to no sleep because the place where I was living was no longer safe for me. But I had no other options. I was too ashamed to ask for help, too ashamed to ask for food, too ashamed to tell people just how bad my life had become. I learned to tolerate life, just like I learned to tolerate the life I had before I ran away. What I didn’t learn, up until a few months ago, was how to live. All this time, the only thing I was learning was how to tolerate things I shouldn’t have had to tolerate. That was not life. That was not living. But everything is different now. For the first time in my life, I am in a safe environment. I don’t have to lock and barricade any doors. I don’t have to worry about who is in my home. I no longer sleep with a knife under my pillow. I no longer go to bed with three layers of clothing on, because I no longer live with the fear that my mother is going to come and hurt me in my sleep. She doesn’t know where I am, and if there ever comes a time when she does find out (because I don’t believe for one second that she won’t try to find me again), there’s nothing she can do to hurt me. I am protected — by people, by three big dogs, and by my own (still growing) strength. I have people who genuinely care about me. They are helping me learn what life really is, what normal is. And I still struggle with things. I don’t always eat like I should, or know what to say in social situations, or how to act when I’m out and about. But I am learning, with their help. And even in the few months that I’ve been here, I have improved so much. I used to avoid the grocery store because it gave me anxiety. Now I look forward to going every Sunday. I used to have meltdowns whenever I’d end up in loud places. Now I go out to eat in noisy restaurants and manage the anxiety with the help of people who support me. I used to hide food in my room because people would take it from me. Now I don’t have to do that at all, because I know that food will always be available to me. I’m learning how to make choices, although I admit that I still need to work on that. I try to navigate through healthy and unhealthy relationships. I try to make decisions regarding my medical issues. I even try to pick out foods I like, which is something I never got to experience before. And it’s not always easy. I still have times when I get too overwhelmed, when I need to ask for help. And now there are people there to help me do that. I go outside so much. Sometimes it’s to play with the dogs. Sometimes to just sit outside to read, or to watch the fireflies, or to look at the flowers. Some nights, I still sit outside and look up the stars; it reminds me that I am free. It’s something I could never do before. And it still amazes me. I never knew what life really was up until a few months ago. I never imagined things would be this way. From the outside, you would think my life would be in turmoil. I’ve been out of work. I’ve been bombarded with some serious health issues. I’ve bounced from place to place just trying to stay out of the shelter, losing a decent amount of my possessions along the way. I’ve lost a few thousand dollars I can never get back. But I’ve learned that life isn’t about having money and things. It isn’t about how long you have to live. It’s about the people you have in your life. It’s about how you choose to spend the time you are alive. I may or may not have a long life ahead of me, and these people may not be my biological family, but that doesn’t matter to me. I am learning to live the life that was meant for me, not the life my mother chose for me. I hold on to things. I become attached. I think it has a lot to do with having nothing. When I ran away, I took whatever clothes and shoes could fit in my bag, my computer, and a few small things, and left everything else behind. And I lived on very little for those first couple of months. The only furniture I had was the bed my roommate let me borrow. I wore the same pair of shoes. I cycled through the same sets of clothes. I cooked and ate out of the same plastic container. And every night by 9 o’clock, I laid in the darkness, because I didn’t even own a light. Then slowly, I started to settle in. I started to buy things. One of the first things I bought for myself was a mug from the Disney Store. It was from the movie Inside Out, my favorite movie to this day. And I used that mug every day, because it was the only thing I owned to drink out of. But that was okay. It was mine. And I held on to that mug. Even as I found myself bouncing from place to place, that mug came with me. It was as important as anything else. I could have easily just brought another mug along the way, but it wouldn’t have been the same. I formed an attachment. To me, that mug was a sign of my freedom. The first thing that was really mine. Then a few weeks ago, I set my mug on the table as I had every morning. I was preparing my breakfast, and accidentally dropped the spoon. Even though it was only a two foot drop at most, the spoon hit the mug in such a way that it shattered the handle right off. I wanted to cry. I couldn’t repair it. A part of me wanted to. A part of me believed that throwing that mug away somehow meant throwing away so much more. But I faced reality. It was just a mug. There were dozens more in the cabinet I could use whenever I needed. Why keep something that no longer served its purpose? I had to let go. I reminded myself it’s useless now and I threw it away. And I was okay. In doing that, I thought about the other things I carry with me, the things that weigh me down, the things that no longer have a purpose. I carry a folder with me wherever I go. It has my medical documents in there in case of emergency. It also has notes from therapy to help me if I ever needed reminders. It also had the cards I’ve written to my family. The cards to my mother. The card to my father. The card to my brother. The letter my mother wrote to me. And the gravestone posters she mailed to my address. I’ve been holding on to these things for so long. Those cards will never be sent. I wrote what was in my heart and let it out into the world, and that was that. My mother’s letter was just four pages of lies and denial. And the gravestones she sent me were not the stones that I deserved. But for some reason I attached a meaning to them. A meaning I didn’t need. I needed to let them all go. So today, three days away from two years of freedom, I took the cards, the letter, and the gravestones and let them go. I remembered the things my mother believed. Bad things have to burn. So they will. I burned every card, the letter, and the gravestones, piece by piece. The card to my father went first. He’s gone now, he will surely never read my words. Then I burned the card to my brother. That one wasn’t as easy. I had to tell myself that I did what I could for him. I hope one day he knows what it’s like to be free, but I can no longer carry that burden on me. Then came the cards to my mother. A lost cause, because even though she knows my words, she will never hear them for their truth. 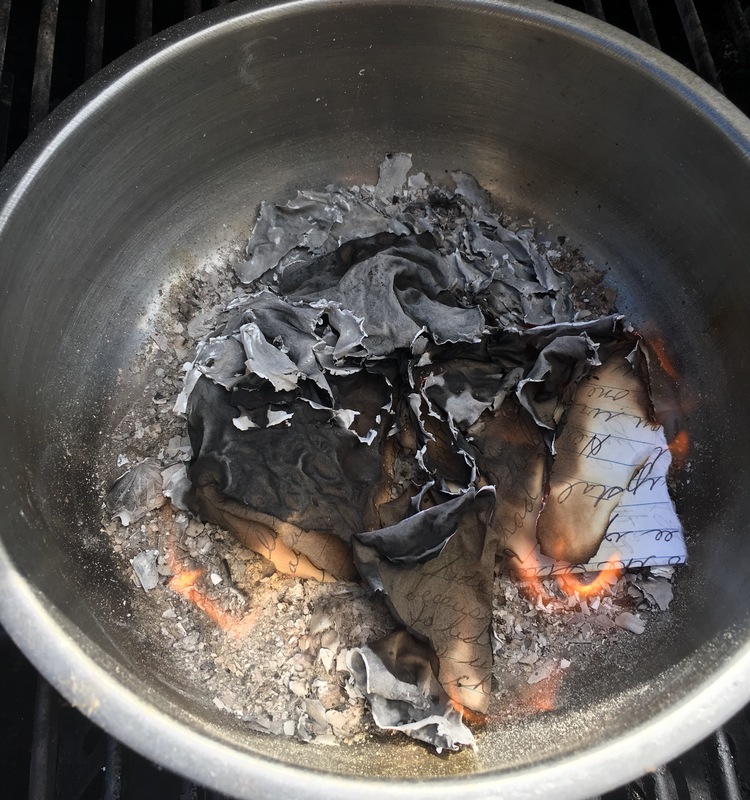 Then I burned the letter she wrote to me. I didn’t even read it over. It didn’t matter. As I put each piece in the fire, it burned within seconds. Just like that, it was gone. Everything turned into indiscernible ashes. I saved the gravestones for last. I debated whether or not I should keep them, but I realized they had no purpose for me. They never did. My mother could wish me dead all she wants. She can send me all the death threats she wants. She could even kill me. But she can never hurt me any more than she already has. The gravestones weren’t burning well, so I tore them up into tiny pieces and mixed them into the ashes. I no longer carry these things with me. I no longer hope for the day my father becomes a father, because he is dead. I no longer carry the burden of saving my brother, because I know that he is not my responsibility. I no longer hold onto my mother’s words, because her words were never the truth. And I no longer hold onto the stones my mother thinks I deserve, because I no longer believe that I should die just for finding my freedom. It’s been almost two years now. I had to let go. I am good. I have worth. I have power. I have hope. I have a purpose. I can have feelings. I can say no. I can live. I deserve care. It wasn’t my fault. I am safe; we are safe. I am free. These are the stones I’ve gained. They aren’t false beliefs. 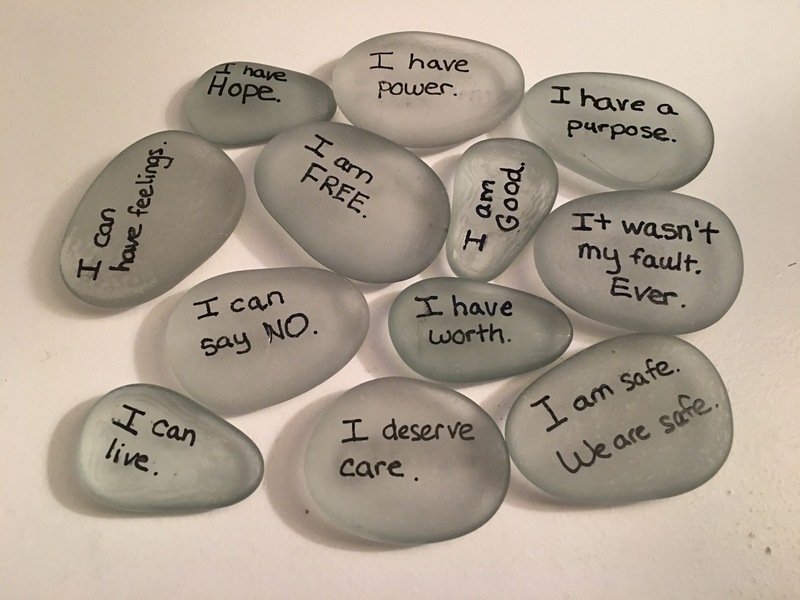 They are the truths I learned from being free.They don’t weigh me down like the other stones.They don’t need to be thrown out to sea, or thrown out of my mind. I hold them close to me. I hold the beliefs in my mind everywhere I go, and the stones in a jar I keep with me. The stones remind me of what’s already growing inside: my new beliefs, the truths that I’ve gained from the lies I threw away. I was a good child. I am a good adult. I am a good friend, a good colleague, and a good human being. I was a good daughter, even though I never got the good mother I deserved. I do good things. I think good thoughts. There is goodness inside of me that was never allowed to come out. But now it can. And now I know. I am a good person, inside and out. My body matters. My thoughts matter. My feelings matter. I matter. I am a human being, and human beings have worth. I am worthy of respect, kindness, and love. I am worthy of family and friendship. I am worthy of so much. I matter. I can make choices now. I may not always know how to, but I am learning. I have the power. My mother can’t make decisions for me anymore. I make my own decisions. She took my power away from me, but I got it back. Now I am learning to use it. I see opportunities. My mother wanted me to be nothing, but I am going to be something. I used to live in the darkness, where there was no light. But now I know that light exists, so I try to talk towards it. Even if I still stumble in darkness, I can remember that there is a flame. I try to believe that there are reasons that things are the way they are. There is a reason I’m still alive when I should be dead. There is a reason I found my way here, in this city, at this job, writing this blog, telling my story. I am not useless, or a waste of space. I have a purpose, and I will make a difference to someone, even if that difference is small. I can be angry without being my mother. I can be sad without being punished. I can cry for as long as I want. I can feel without fear. I can feel something other than constant fear. I don’t have to hide my feelings anymore. I am learning that it’s okay to feel. I couldn’t say no before, because saying no never worked. No one listened. I became powerless. I lost my ability to say no, and it caused me a lot of pain. But I can say no now, because I have power. I don’t have to comply with other people’s wants at the expense of my own needs. I can say no without feeling bad or wrong for doing so. I can be assertive now, and no one will punish me for it. I don’t have to die now. I am not destined for a life of pain. I still hurt, but hurt is not my life. I no longer wait for death. I no longer wait for an end to the pain. I find relief in the every day. The little things are the reason I can keep living. I deserve to receive care from others. Friends, coworkers, doctors, therapists. I am worthy of others’ care. I can go to the doctor. I can ask for things I need without having to feel guilty. And I deserve my own care, too. I deserve to take care of myself, in the ways I should have been taken care of as a child. My family’s failures were not my fault. My father’s death was not my fault. The abuse was not my fault. I was a child. I wasn’t to blame for any of this. It was never my fault, no matter what she said and still says. I didn’t do anything to deserve any hurt. I am safe. We are safe. I got away. I escaped. My mother can’t hurt me now. She can’t hurt my parts any more, either. I try to let them know that. I try to let me know that. I don’t have to be scared all of the time now. I am trying to learn how to be not scared. I can leave my house. I can walk down the street. I can lock or unlock my door. I can buy what I want. I can eat what I want. I can do all of the things I should have been able to do before, but couldn’t. I am free now. She can no longer control me. They are the stones I’ve gained.